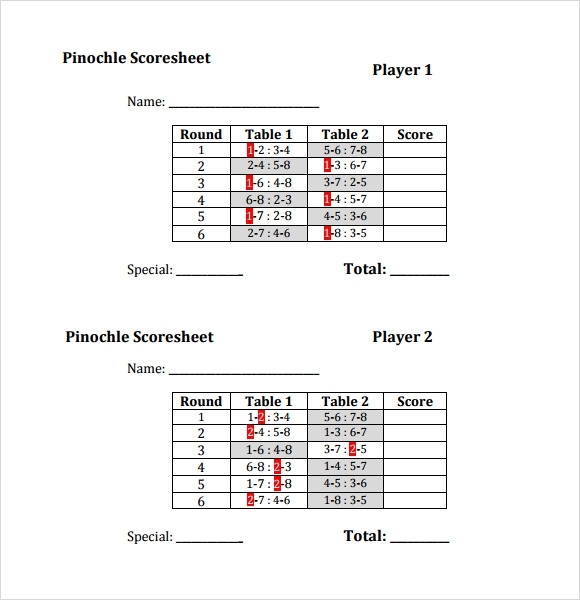 Canasta is the card game popular not only in the South America but in some areas in the United States, if you need a device to print and record the points earned by each player, the canasta Bridge Score Sheet Templates will ease your choosing the points of each team. 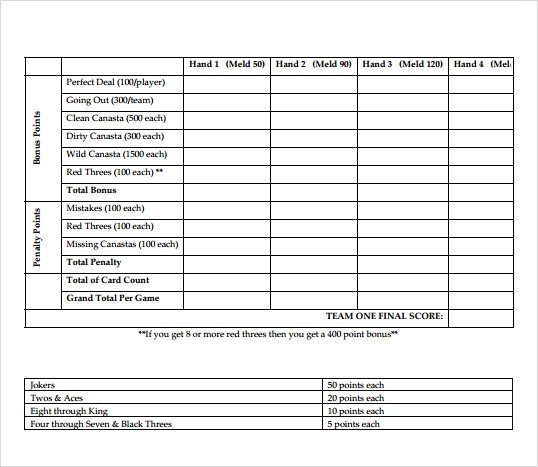 The recording tool where you can look into the scores based on the melds that they have in their hands and bonuses earned in the game.The example templates are free at the internet and download the sample format you can modify based on the canasta that each country have in their place, it can be also found at Microsoft word or excel. 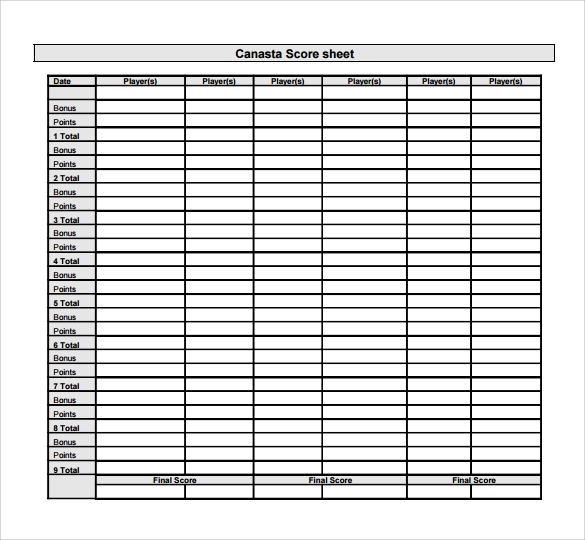 The canasta score sheet will make sure that each team will record their score based on their melds of cards they have. This is a simple sheet that you can use and it has a row for the names of the players. It also has a column for each round where you can list both the score as well as the basic. It has 8 rounds and you can add them up as you go or at the end. For those who are playing the game with some extra bonuses, then this is great. It has columns for 4 rounds with different bonuses, including perfect deal, red threes, wild canasta, dirty canasta, clean canasta and going out. This is another unique score sheet that you can use. It lists the teams and has space for 2 games with the different scores, including for sevens, wild cards, going out and much more. This makes keeping score so much easier. This is another great option that has the names at the top of the list with the date listed as well. On the left, the column has the rounds along with the points for every round and a place to add them up after. These score sheets make keeping score for the game much easier. If you print these out, then you simply need to have one handy and keep filling it out as the game goes along. It is also good for a reference regarding the number of points that each hand is worth and will allow you to know who is in the lead as the game progresses. 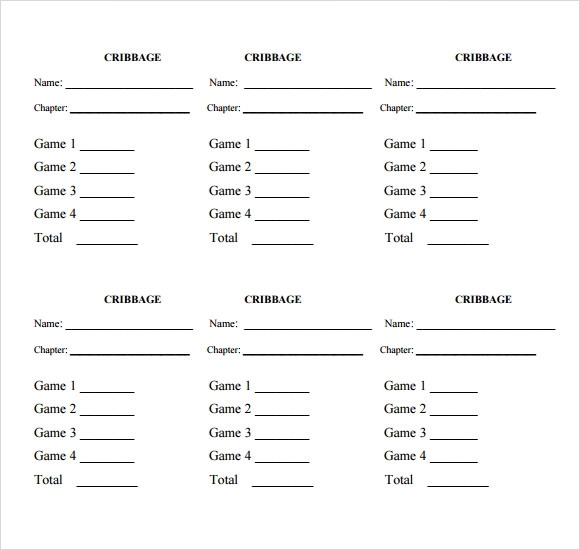 These are ideal for making sure that all of the points are written down, to ensure that there aren’t any arguments or disputes during the game.You can also see Sample Chess Score Sheet Templates. 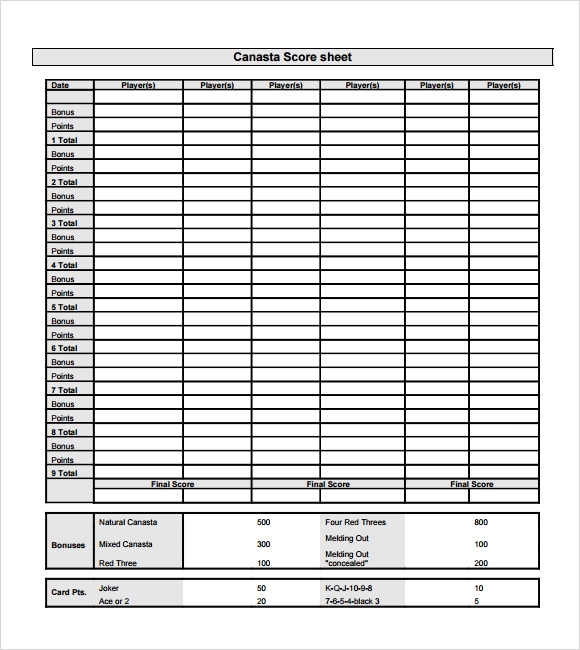 When do I need Canasta Score Sheet Templates? If you are going to be playing a game, especially during a tournament or a knock-out game, then you need these score sheets. You can write down the scores for every hand for the players, including partners. Also, it helps you to be able to keep track of the points and count them up after every round to ensure that everything is going smoothly. It is important to keep track of the score for every game, even if you aren’t playing for anything other than pleasure. How To Create/Write A Canasta Score Sheet Templates? These are easy to create or write, especially if you download them. You simply need to browse through the various options that are available. Once you have downloaded them, then make sure to print them off. You can just go ahead and fill out the information as well as the score during the game. This makes it so that you don’t have to write down the entire thing every time that you play and the points are already written down. 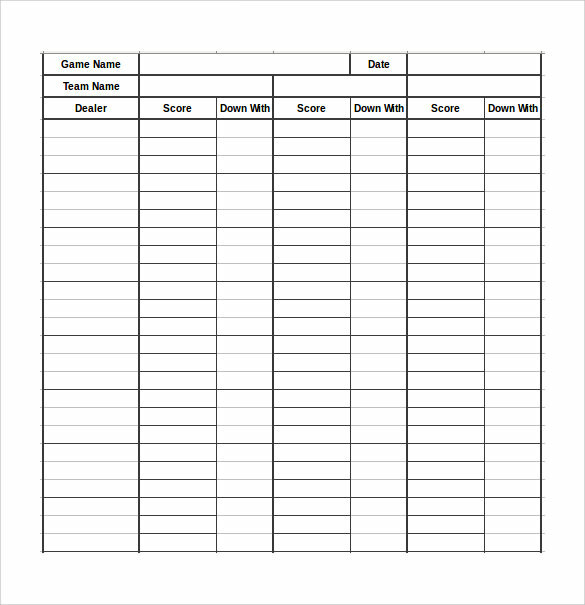 These score sheets are easy to create and will allow you to easily keep score as the game moves along. You can write down the names of the players and the number of points for each round, which makes tallying up the final scores so much easier. You can also see Sample Hockey Score Sheets.